Lille (France), April 21, 2015 – Europe’s leading economy hospitality brand is opening a new franchised hotel in Lille, France. This hotel, the ibis Lille Centre Grand Palais, is the first to showcase every new concept that this brand is introducing. The hallmarks include the wide open areas, designer features and comfort-enhancing amenities to welcome business travelers and tourists keen on exploring this city. 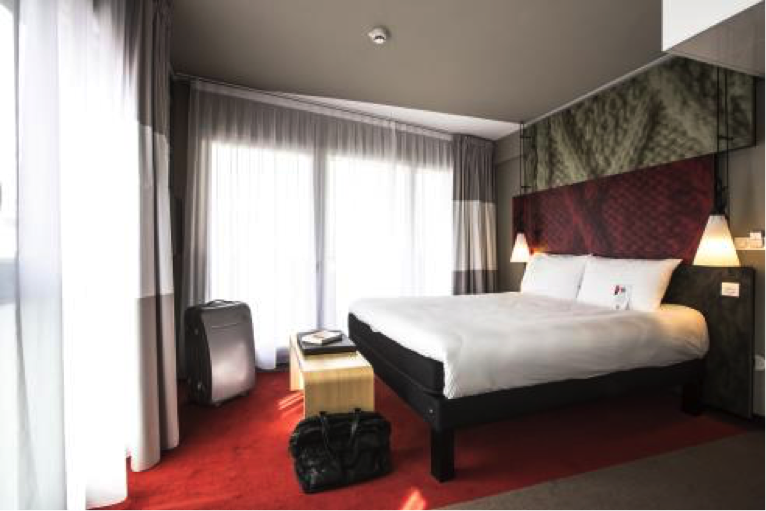 The ibis Lille Centre Grand Palais is a short walk from Lille Flandres and Lille Europe train stations and also close to the two subways of the city, in a downtown location, and in a quiet spot. So it has a number of advantages for guests looking forward to an enjoyable stay. It is in a prime position for tourists who want to explore the city, near the Palais des Congrès (a convention center), Zénith (a concert venue), the town hall and its Beffroi (belfry, one of the city's landmarks), the old part of town and all the main interesting cultural, touristic and economic locations. The ibis Lille Centre Grand Palais opened on March 4, 2015, after 18 months under construction. It spans seven stories and was built to encapsulate the brand's up-to-the-minute comfort spirit by Olivier Dolicque and Baptiste Plantet from APSIS, a Lille-based architect firm. Marie-Laure Ducrocq created the interior architecture alongside the ibis teams. The natural raw materials and warm colors (woods and reds) in the reception areas add an unprecedented relaxed and inviting dimension to economy hotels. These areas are open and interconnected. The partitions in the lobby are gone so staff and guests now meet in an open, more laid-back area. An ultramodern projection screen in the background broadcasts a wealth of useful information (weather forecasts, pricing, deals, etc.) with an informal, intuitive slant. Around the reception area, guests can now have a seat in the TV lounge or Business Corner to catch the latest news, connect, work, read or drink their coffee. This state-of-the-art, cozy hotel has 91 Sweet Rooms by ibis™, including nine suites and three rooms for mobility-impaired guests. Prices start at €73€ and these rooms will envelop travelers in a unique, original experience of economy hospitality amid printed decorative motifs, elegant and practical lighting, new headboards creating a four-poster effect, and snug flooring enhancing the comfortable, home-away-from home feel. The rooms are 17 to 21 sq. m. and all have the Sweet Bed by ibis™, including the duvet and super-soft pillows, 22-inch flat-screen LCD TVs, generously-sized bathrooms, modular desks and free Wi-Fi. And a lot of work went into the soundproofing so guests can also sleep and work peacefully. The hotel also offers ibis kitchen Lounge concept. To suit guests' preferences, breakfast is served from 6:30 to 10:00 am and the buffet includes a choice of local specialties. The Lounge Bar welcomes patrons 24/7 and serves an assortment of snacks in laid-back, easygoing surroundings decorated with a sense of humor (bubbly visuals, rocking chairs, game-board tables and more). The ibis Lille Centre Grand Palais also has a light-filled 30 sq. m. meeting room opening out onto a terrace for professional customers. This meeting room can seat 14 to 22 people depending on the configuration and includes a video-projector, screen and Wi-Fi access. François and Marc Ducrocq, two brothers from the area, own the hotel and hold the franchise for the ibis Lille Centre Grand Palais. They are not your typical entrepreneurs: they started out studying chemistry and sales, worked for hotels to pay their way through school, and never looked back: they have been fuelling the Lille area's economy since 1998 and have opened seven hotels there so far (six of which remain open) covering the three family brands (ibis, ibis Styles and ibis budget). "We wanted to stay independent, and were looking to buy a high-profile hotel backed by a brand. We found that the ibis franchise fit our budget and provided the affordable pricing we wanted: it is a turnkey economy product from a leading brand and a partner we can trust," explains François Ducrocq, one of the ibis Lille Centre Grand Palais owner-franchisees. The ibis Lille Centre Grand Palais is their seventh ibis hotel, and the next chapter in the story that François and Marc Ducrocq are writing about a longstanding partnership in economy hospitality, along with the hotel's general manager Yves Poletti. In this all-new hotel, they have agreed to team up with ibis to showcase the brand's trailblazing products and services including its new reception areas and the new Sweet Room by ibisTM. They are planning to renovate their other hotels - using these new concepts to update and upgrade all their ibis franchised hotels - in due course. 71 hotels, all Accor Group brands (Novotel, Suite Novotel, Mercure, ibis, ibis Styles, ibis budget, Hotel F1 and Adagio Access). ibis is one of the economy brands in the Accor Group, the world’s leading hotel operator (3,700 hotels in 92 countries to date). It has 129,000 rooms in 1,031 hotels in 59 countries so far and is constantly blazing new trails to take its three core values – modernity, comfort and convenience – to new heights. It has inter alia created a revolutionary bedding concept – the Sweet Bed by ibisTM –, new shared areas, an up-to-the-minute food and beverage service – ibis kitchen – and nurtures each and every team member’s spirit of service. ibis is the first hotel brand to earn ISO 9001 certification – 87.5% of its network is now certified – for its uncompromising professional standards and reliability. And 77% of the ibis network is also ISO-14001 certified, mirroring this brand’s environmental drive. ibis was established in 1974 and has grown into Europe’s leading economy hotel brand and the world’s fourth-largest chain in its category.